Transition Norwich Blog: Festival of Transition: What if . . . the People had a change of heart? Festival of Transition: What if . . . the People had a change of heart? Today we are running our blog week in tandem with the Social Reporters Project. We start out with an introduction to the week (and follow on from my last week's post on Development). I am in the Museum of East Anglian life at the Festival of Transition event, What if . . . the sea keeps rising? and I want to put my hand up and ask about the rivers. Why did the government withdraw its funds for the river defences of the Ore, the Deben, the Alde, the Blyth? But the question does not happen. The woman from the Environment Agency in London is staring into her computer and talking about plans and scenarios and how some moves are less controversial than others, as we all gaze at the aerial shot of the lovely sinuous and green waterlands of coastal Suffolk. Maybe it's because I know the answer: because when the seas did rise up in a storm surge in 2007, and there was a massive flooding of the Blyth, the environment officer told us the land was not worth much anyway. Only marsh and watermeadows for a few cows. And that the small-scale local fishing was "not economic", so it made no odds that the harbour collapsed. The money for flood protection would be secured for the big inland towns and commercial sea ports, such as Great Yarmouth and Felixstowe. That was the moment, just before I stumbled upon Transition, that my small world cracked upon and I found myself among the people, defending the place we all loved in our separate, and now connected ways. We spoke out in village halls and protested on the beaches, and then some of us picked up our spades and began to remake the river walls ourselves. Before the advent of diggers, all the river walls were mended each winter by a few men. Tony Butler, the musuem's curator, showed us a ditch spade from among the extraordinary set of traditional tools on the 14th century barn in which our meeting is taking place. That's when you see the past and the future in your own hands. How everything hinges ultimately on our own efforts: Who will dig the land, who will shape the land, what is it worth, and in what spirit will this work be done? Up until the 1950s half the population in Suffolk worked on the land; now it's 0.5 percent. The country has become something we understand at arm's length, a Suffolk of industrial agriculture, fringed with nature tourism and leisure. And yet in our hearts, somewhere, we know there is a deeper relationship we have with our homeland, and if we were wise, we would be seeking it out. The Festival of Transition has been running now since May in a series of events across the country: walks in London, talks at the Bristol Green Fair, at the Hay Festival and in Manchester. 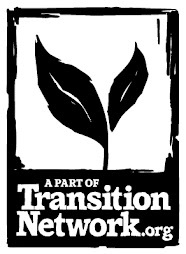 They have been organised by the Transition Network and new economics foundation, as well other organisations. On Wednesday this Festival culminates in a 24 hours of possibility in which everyone has been asked to imagine what life will be like in the future and live it for that one day. Everything from small individual acts - not using a car, making something by hand - to holding a street carnival. 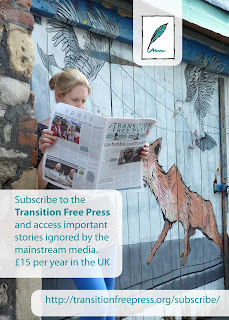 This week on the blog we're going to share some of those actions and reflections as Transitioners across the UK. June 20 is a big day. It's the start of the Rio+20 summit in which the future of the earth will be discussed by world leaders; it is the summer solstice, the longest day, the day of maximum light, when the sun reaches its zenith in the sky; and it's also my birthday. So in the way days are markers for time, historically, planetary, personally, this midsummer brings a shift of attention. Everything enacted, felt and imagined that day will alter the course of events thereafter. Traditionally midsummer is a door in time, in which other dimensions, possibilities you have never thought of, slip through our imaginations into this physical world. 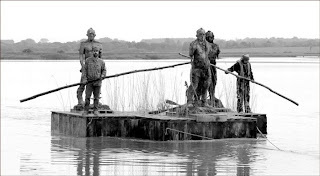 And maybe this is why I don't ask the government officer why they are abandoning the farmland and the bird reserves, and why instead I find myself looking at Laurence Edward's The Creek Men as they float down the River Alde on the way to Snape. We think the government will turn the planet around. But they won't. It will be the people who will turn it around. The people who love the land, who know that there is more to life than economic necessity. They will not be the people you expect. What am I going to do on J20? I will get up at dawn and see the sun rise in the East out of the sea at Southwold and, if it's not too windy and rough, I will jump into the waves and have my first swim of the year. I will sit in the garden and have breakfast amongst the rock roses and ceanothus thrumming with bees. Then I will travel with three students from Norwich across the country to the Sunrise Festival and watch the sun set in the West amongst the hills in Somerset. I'm on the crew for the Transition Tin Village and giving workshops on grassroots communications and medicine plants, so the day will start quietly and end in a great crescendo of dance and song and people. But that's the outside event. What am I really doing on J20? In a recent post during our week on Development, I asked what if beauty were the driving force behind all our actions, rather than economics? What if the basis of our lives was not how the fittest survived, but the how the most lovely and loving thrived, the people and the flowers? 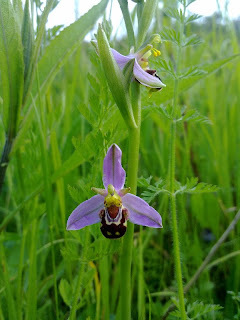 Looking for the bee and pyramid orchids on a roadside verge on the way home from a Bungay Community Bees farm visit, a man stopped and complained to us how the flowers were getting in the way of his vision of the road. There wasn't much there anyway, he said, and kicked the grass as if to prove the point. Richard, who knows every inch of this land, explained why this was a roadside nature reserve, while Lesley, Mark and I kept looking, eyes down. The defender of cars disappeared into his house. We found orchids everywhere. "When they moved the green-winged orchids from the Tesco roundabout in Lowestoft they disappeared," Lesley said. "They didn't like being moved," Richard said. "Nature has its own way." "Maybe they didn't like Tescos, I said. And we all laughed. The fact is life is surprising and comes up with extraordinary solutions, so long as you allow it to, so long as you don't get intimidated. If you focus on the things you love and know that nature has its own way, including your own. That's something that creators know, and all people who work with wild flowers. What if . . . the unexpected happens? That the drivers of cars don't always have the right of way, that the politicians don't always have the voice? That what you do on a summer's day alters the destiny of the planet? Who would have imagined for one minute, for example, that the Southwold Journal one of the most traditional local papers, in one of the most conversative towns in Britain had Transition on its front page this week? People in the town have decided to resist the advance of the Costa Coffee chain in our high street and have been set back by the county council planners' recommendation. So the postmaster and chair of the local chamber of commerce, Guy Mitchell, told the reporter about the recent Totnes campaign, quoting Andrew Simms from nef (and chair of the What if . . . the Sea Keeps Rising) and Frances Northrop from TT Totnes: "Ultimately it’s the community that knows its own needs and that voice is getting louder". So that's what I am going to do on Wednesday, I'm going to tune into the sun as it rises and listen out for that other voice as it comes through. I'm going to keep an eye out for the beautiful and the free. I'm going to hold out, for what I always hold out for, a change of heart amongst the people. I'm going to hold open the door. 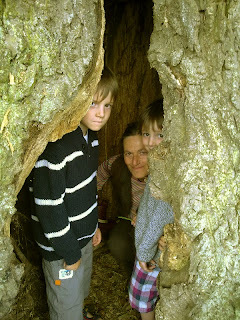 Images: Laurence Edwards The Creek Men; community toolkit from Festival of Transition; with Tristram and Reuben in the hollow oak at High Ash Farm; bee orchid on the verge outside Bungay; Mark in the Library reading the Southwold Journal. Your post has given me a measure of hope again, and a rekindling of the will to continue fighting for a livable future. Again, thank you. I’ll watch the sun come up tomorrow and think of you enjoying the afternoon warmth of a sunny solstice day. Thanks for holding the door open. Is Development a Dirty Word?